We see people’s confusion when they see that BEAT Fitness offers barefoot training at our gym in Wexford. The word “barefoot” immediately conjures images of the beach, the pool, or just relaxing at home after a long day. Very few people associate being barefoot with exercise. But there’s been a barefoot running movement for years. Athletic shoe companies now market minimalist shoes as “barefoot shoes.” Yet working out barefoot still sounds strange to most people. 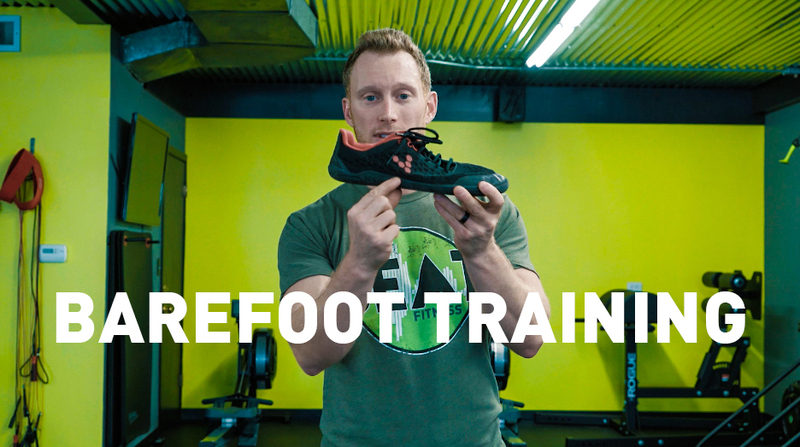 Here’s why barefoot training in Pittsburgh is becoming more popular. Walk through any Rite Aid, Walgreens, or CVS, and you’ll see entire aisles dedicated to addressing foot problems. Inserts and insoles intended to relieve or altogether prevent foot pain so you can comfortably wear your shoes. However, researchers have come to find that shoes may actually be the culprit behind much of the foot pain people experience. Having our feet cramped in shoes all day, particularly when we’re physically active, can weaken the muscles, tendons, and ligaments of the foot. Proper mechanics of the ankles and knees are also negatively impacted, contributing to an increased risk of injury. A typical athletic shoe has a soft cushioned insole with a hard rubber outer sole. And most of us typically wear socks with our shoes. These materials raise our feet about an inch or more from the ground. This disrupts the natural biofeedback of the foot. It isn’t actually touching the ground. We in turn become an unknowing victim of unnatural mechanics as we walk, run, or rely on our feet for solid positioning and support. Studies have shown that athletic shoes severely alter the mechanics of running. Runners strike the ground with their heel, rather than a more efficient foot strike. A heel strike’s impact with each stride can be three times an individual’s actual body weight. This may be why the number of knee injuries and ankle sprains among runners and athletes has increased since the advent of the athletic shoe. While the science is still out, it makes sense thus far. To prevent injury, sensors in the foot send signals to the brain to make subtle adjustments to our body positioning or alignment. Therefore, a foot that isn’t engaged freely with the ground or floor below us has a higher likelihood of injury. The signals are disrupted and the efficiency of our movement is impacted. Your feet and your hands happen to share the same basic genetic architecture. Have you ever had trouble completing certain tasks with gloves on? The simplest task can be complicated by gloves due to a reduced awareness or sensation in your fingertips. Once you remove your gloves, it’s easy peasy. When we’re working out, our feet are the only part of our body that come in contact with the ground or floor. Any movement we perform begins with our feet’s connection to the ground. Power essentially comes from the bottom up. So it’s easy to understand why covering your feet with shoes can decrease power or hamper your ability to lift more weight, run faster, or jump higher. Improved Balance & Overall Sports Performance – Barefoot training strengthens and stabilizes the muscles of the foot and ankle, which makes them stronger. Going barefoot for exercises like pushups, deadlifts, lunges, and sprints offers certain mechanical advantages and an increased range of motion. Improved Perception of Space & Movement – Barefoot training helps us connect with and feel the ground below us for better balance and more natural movements. Stronger Ankles and Increased Support – Your feet are the support base for your entire body. Knee and back problems – even poor posture – can often be attributed to improper foot mechanics. Shoes put an unnatural pressure on the knees, spine, and neck. Improved Muscle Alignment – When you train barefoot, different muscle segments are used and strengthened. The neuromuscular pathways of the feet and legs are enhanced as is the efficiency of your movements. Arches Become Stronger – Shoes artificially raise arches. In doing so, the arch muscles aren’t used as much and tend to weaken over time. The weaker the arches become, the more support people seek to temporarily relieve the tension they feel. However, that kind of artificial support doesn’t address the root problem, which creates this never ending cycle of orthopedic problems. Barefoot training lets you use and naturally develop arch muscles to prevent such issues. Increased Range of Motion – Our Pittsburgh barefoot training increases the flexibility and mobility of the foot. This leads to more seamless and natural shifts in movements and an overall wider range of motion. Healthier Feet – Shoes are a leading cause of foot problems like calluses, corns, bunions, hammer toes, athlete’s foot, ingrown toenails and fallen arches. Intense physical exercise in shoes can further develop or aggravate such conditions. Training barefoot prevents these kind of foot problems. Better Chi (Qi) – No part of our body touches the ground more than our feet. This makes your feet the starting point for the body’s flow of energy. Barefoot training helps this energy flow more smoothly. Injury Prevention – A foot with lost stability or mobility adds stress to the hip, knees, or ankles; increasing the likelihood of injury. Many of the hip problems plaguing older adults may actually stem from weak feet. This makes barefoot training somewhat of a preventative exercise. ARE YOU READY TO JOIN THE BAREFOOT REVOLUTION? Stronger feet create a more solid foundation for a stronger body and a better you. Our barefoot training in Pittsburgh is a great compliment to other training. If you’re interested in a barefoot training class, click here to learn more or give us a call at 724-900-0323.